On 26 December 2004, almost 250,000 people were killed when an earthquake in the Indian Ocean triggered a tsunami wave that wiped out whole communities across south Asia. It was a disaster on an unprecedented scale. Tim Heatherington, rest his soul, was sent there for Christian Aid with his work put into the news for the anniversary this past few days. Rodney Rascona was there from the beginning, covering it for over a month initially and thereafter over a couple of years to follow up on things. Two days after the tsunami hit Indonesia, I was sent to document the damage just dawning on India’s shoreline. 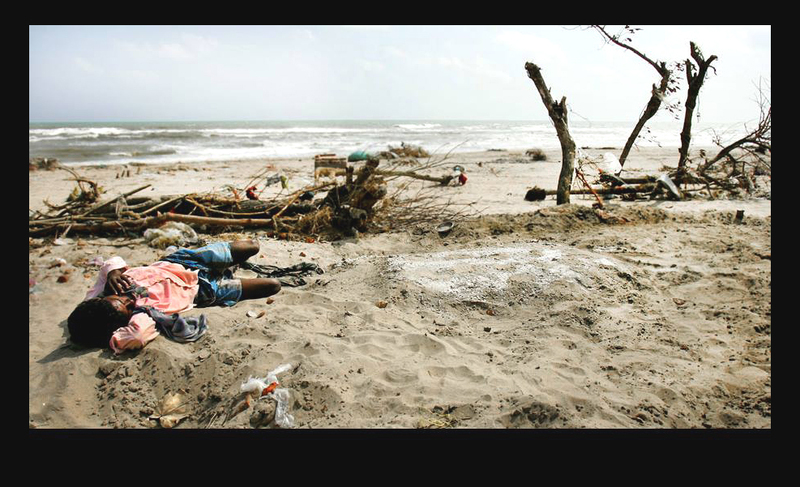 In the early morning hours, walking the beach already littered with absolutely complete destruction, crying women preparing ceremonial offerings for the dead, smoldering funeral pyres and people just staring out to sea. I had just walked past this man, pausing farther ahead to wait for my interpreter to catch up with me. Abraham stopped, bending down to speak with him when I noticed he was glancing my way, signaling me to wait. Joining me quietly..“That man” he said, “he lost his wife, his house, his family…everything to the sea, but right now he tells me that “he sleeps on the beach with his son.” It took me a minute to comprehend what Abraham was saying, that this humble man had just buried his boy in the sand and lay sprawled there, sleeping with him, not wanting to leave his side. We didn’t know what to do so we stood there as silent witnesses and quietly cried. A Photographer’s memory, my memories at times, are kept inside a little box under my bed with it’s lid tightly roped shut for things you wished you’d not seen, wished you’d not heard..nor felt.